Take advantage of the USB-C™ port on the latest MacBook, Chromebook Pixel™ or other laptop to get quick access to your external drive. 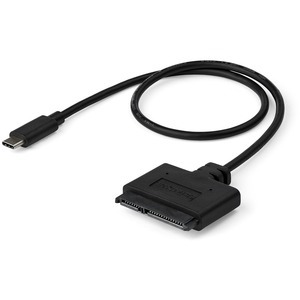 This cable-style adapter lets you use the USB Type-C™ port to connect your laptop directly to a 2.5" solid-state drive or hard drive, and access it through ultra-fast USB 3.1 Gen. 2 (10Gbps). It's fast and easy to connect to your SATA drives, with no additional accessories required. You can quickly access your valuable data, wherever you go, using this cable-style adapter. It's USB powered, so there's no external adapter required, and features a compact, lightweight design that you can easily tuck into your laptop bag or carrying case. The adapter cable lets you quickly swap HDDs or SSDs without having to install your drives into an enclosure. You can copy or retrieve data from a 2.5"" SSD or HDD quickly. It gives you easy access to your drive for data migration, drive cloning and data backup applications, with the fast performance of USB 3.1 Gen 2. The USB31CSAT3CB is backed by a StarTech.com 2-year warranty and free lifetime technical support.